These cookies are actually Tony’s absolute FAVORITE. I’ve probably made him 10 different kinds but in the end he always asks for these. 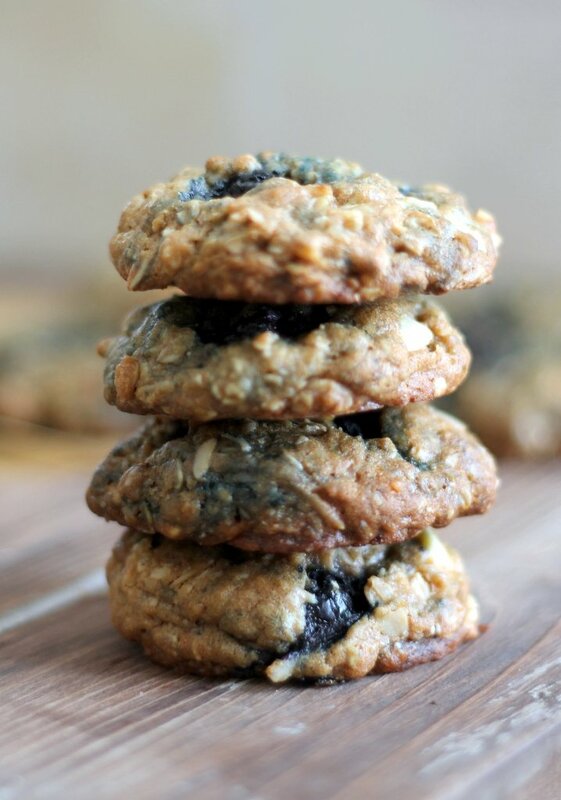 And I mean, what’s not to love about chewy oatmeal cookies bursting with blueberries in between layers of coconut and creamy white chocolate chunks? 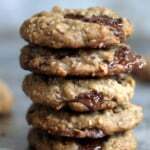 These cookies were inspired by my chocolate chunk oatmeal coconut cookies, but I switched up a few ingredients to make these a little more summer like. I love using coconut oil in cookies because it keeps the cookies super chewy, yet they still get slightly crispy along the edges. My favorite part about these cookies are the blueberries that burst in your mouth when you take a bite. That combined with the sweetness of the white chocolate plus chewiness of the coconut and oats is one of the best combos I’ve ever tasted. Personally I think the cookies taste a bit like a bakery blueberry muffin. 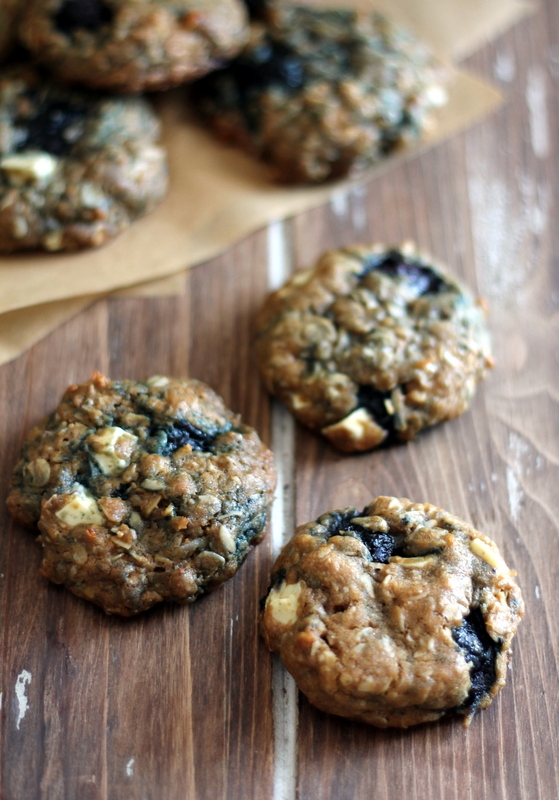 Yep you read that right, COOKIES THAT TASTE LIKE A BLUEBERRY MUFFIN! Quite heavenly. I hope you get around to making these soon and be sure to tag #ambitiouskitchen on Instagram. 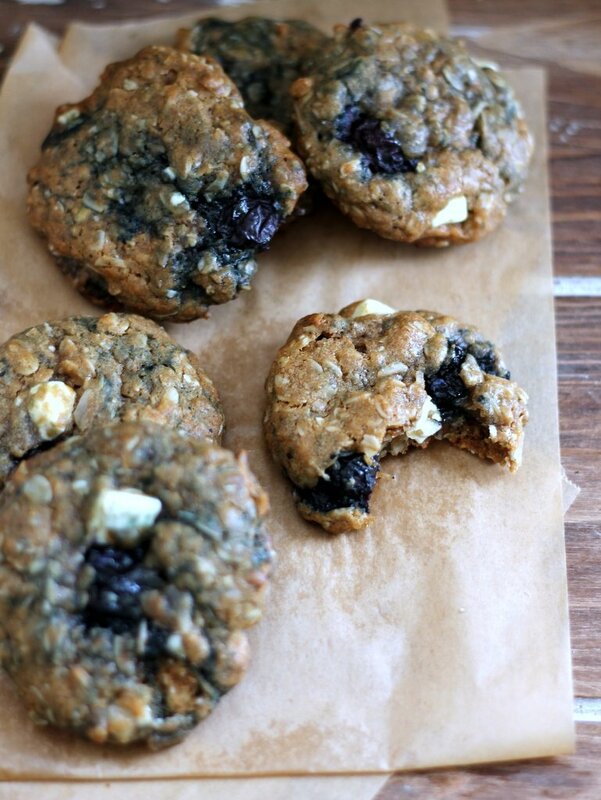 Chewy melt-in-your-mouth oatmeal cookies bursting with blueberries and layers of white chocolate and coconut. These will amaze you! Preheat oven to 350 degrees F. In large bowl whisk together flour, oats, baking soda, and salt; set aside. In bowl of an electric mixer beat together melted coconut oil and brown sugar until smooth. Add in egg and vanilla; beat again for 2 minutes or until smooth. Stir in flour & oat mixture to the wet ingredients; mixing until well combined. Slowly fold in coconut and white chocolate chunks. Use a cookie scoop to gather a large rounded tablespoon of dough. Flatten the dough in the palm of your hand and add two blueberries on top, roll dough back into a ball and place on cookie sheet, then slightly flatten the dough ball with your fingertips. Repeat with each dough ball. Bake for 10-13 minutes or until edges just begin to turn golden brown. Remove from oven and cool for a few minutes on baking sheet until the cookies firm up a bit. Transfer to a wire rack to allow cookies to cool completely. Makes 2 dozen. I always bake a test cookie first to see if it comes out the way I like it. If the cookie is too thick you can flatten the top of the dough with the palm of your hand before baking. Another option is to add a teaspoon or two of milk or coconut oil to the dough to make them thinner. 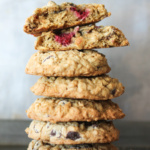 38 Responses to "White Chocolate Blueberry Coconut Oatmeal Cookies"
Thanks! It is pretty strange. I’m working on trying to fix that – I was unable to pin, and then just tried and it let me. Anyway – glad you like the cookies! LOVE these! (Really only 2 blues a cookie??!) I was able to pin! Glad you were able to! Yes only 2-3 blues otherwise they’ll become cake-like and fall apart. I could eat 10 of these! I don’t have coconut oil….does it add flavor that I would miss by substituting?? Can I use another oil? It does add a little flavor if you use unrefined coconut oil. If you use butter, try using melted or VERY softened butter. I haven’t tested them with butter though so I’m not certain how they would turn out. Yes, yes, yes yes yes. I like everything about these. Yes, you should use frozen blueberries! Thanks Monique but I have one more question…lol I’ve started to make the cookies and it says to add melted coconut oil. My oil looks like regular oil!! Do I heat ir??? So sorry for the delayed reply. Usually coconut oil is solid at room temperature, but sometimes it can come in a liquid form. 🙂 Hope this helps. Please let me know how they turn out for you! 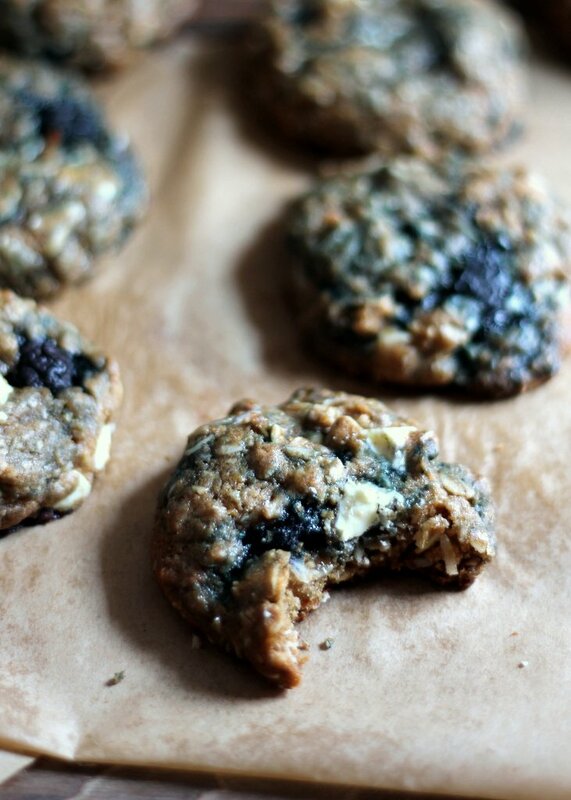 These remind me of blueberry muffins but oh so much better! Hi Katie! You can try. I find it easier to work with frozen berries as they don’t burst when you work with the dough. can I use GF flour instead? Or coconut flour? 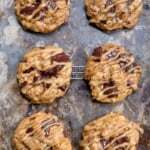 Hi Monique, Great recipe and amazing blog. 🙂 I made this recipe with a few modifications to increase the protein content and eliminate the refined flour and sugar. I used ground rolled oats instead of AP flour(may need slightly more than a cup though…I used about a cup and 2 tbsp. 1/2 cup of coconut sugar plus 2 tbsp of honey instead of brown sugar and 2/3 cup of coconut + 1/8 cup of ground almonds + one scoop of vanilla protein powder and dark chocolate (50g) instead of white chocolate and they are amazing!!! My cookies look very similar to yours. I also made a chocolate version for my son with almost all the same modications but instead of a scoop of protein powder I used 1/4 cup of unsweetened cocoa powder. Thanks for these modifications! I like to eliminate refine flour and sugar from my baked goods. Monique, these look amazing…I’m new to the blogging world and your blog has been one of my favorite sources of inspiration! Has anyone made it with butter? Curious if that worked out. I have and they work great! Is it better to use frozen blueberries? Rather than fresh blueberries? Why does the ingredient list say only 1 egg, yet the instructions list an egg and a yolk? Fixing that now. It should only be 1 egg. What can I substitute for dark brown sugar? Coconut sugar or regular brown sugar. 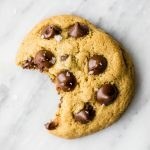 Hi Monique, I’ve been reading your blog for a while now but last night I finally made something–these cookies! 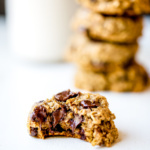 They have been the biggest hit with my husband and one and half year old daughter, and I am so happy to finally have a healthy cookie recipe that tastes good. Thank you! Love your blog…everything I hav made from it comes out perfect and yummy! 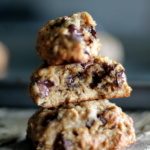 Qujcik question, though – I just made these for the first time today and they were realy dry before baking…I’m wondering if it has to do with the coconut oil? I measured 1/2 cup and then meted it….but now i’m wondering if I should have had 1/2 cup of the melted oil. can you please confirm the measurement? THANKS! Hi Jennifer! Okay, if they are dry (which they shouldn’t be) you should add more coconut oil to them. I would try 2 tablespoons. By the way, did you follow the recipe exactly as written? No changes? Also, yes it should be 1/2 cup of MELTED coconut oil! Hope this helps! Thanks monique for the speedy response. they were quite dry coming out of the oven and I didn’t really make any substitutions, other that using just regular chocolate chips instead of white. I’ll try again! 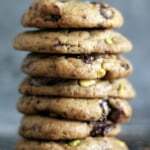 Can I use whole wheat flour or oat flour instead of all purpose flour? Hi Kelly! I would recommend using a mix of whole wheat and all purpose flour if you can (just to maintain consistency). Oat flour absorbs more liquid than all purpose flour, so I wouldn’t recommend subbing it (as I’m not sure exactly what the liquid ratios would be).